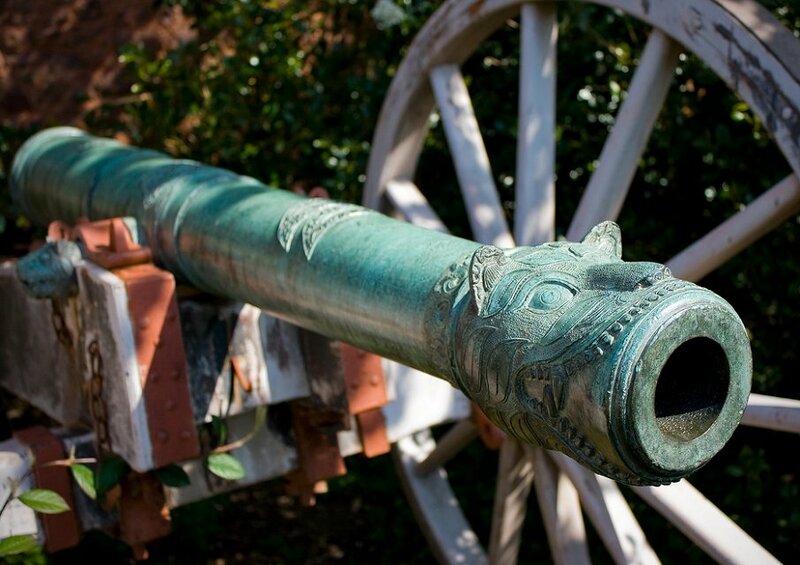 In the 18th century it was often the practice for British regular infantry and militia regiments to keep attached a pair of light artillery pieces or battalion guns. By the end of the century the practical disadvantages of this piecemeal method of deploying artillery had become so obvious that most were sent into storage, and, shorn of their artillery, many militia regiments took to the new fashion of incorporating a couple of companies of riflemen instead. But the practice of battalion guns lived on among a few volunteer regiments, which were happy to acquire the kudos of their own artillery detachment. Colonel John Kynaston Powell’s regiment of Shropshire Volunteer Infantry, raised in 1803 and covering much of the North of the county, was already something of an unwieldy monster (18 large companies – two flank and 16 battalion) when in July 1805 each company was reduced to 97 men to make room for an artillery detachment of 32 privates plus NCO’s, officers and a drummer. Often, volunteer battalion guns were purchased through subscriptions by local communities, but the “great guns” of the Shropshire Volunteers were a gift – or at least a loan – from Edward, 2nd Lord Clive and 1st Earl of Powis, the eldest son of Robert Clive, “Clive of India”. And the guns had a particularly interesting history. From 1798 to 1803, between spells as Lord Lieutenant of Shropshire and Colonel of the Shropshire Militia, Clive was Governor of Madras. 1799 saw the second, and successful, siege of Seringapatam (Srirangapatna), the fortress of Tipu Sultan, Muslim ruler of the Kingdom of Mysore and Ally of Napoleon. The storming of the city resulted in the death of Tipu and the complete defeat of his forces. 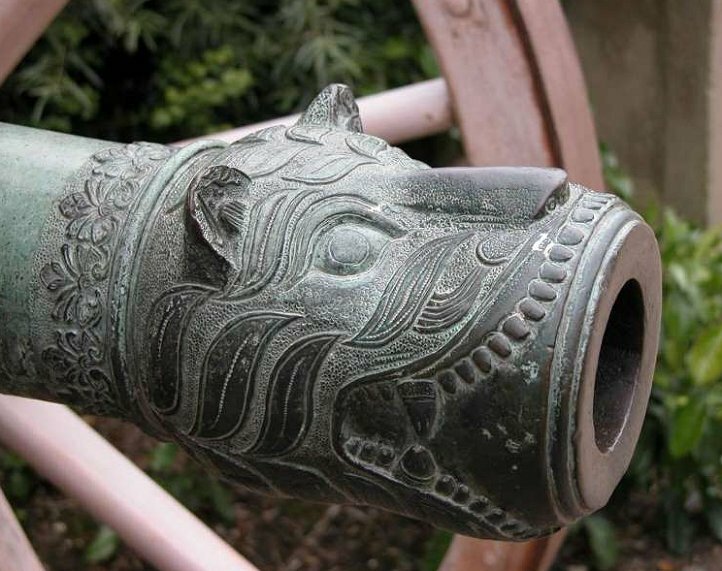 Among the huge quantities of trophies captured were 927 of Tipu’s cannon, almost 400 cast in bronze, and over 200 manufactured at his royal foundry. The disposal of this wealth of ordnance was the privilege of the East India Company, and two fine examples were given to Clive, who brought them home to England and passed them to Kynaston Powell’s volunteers. The cannon arrived as loose barrels, so in October 1805 the regiment resolved to have “proper Harness” and a pair of shafts made for each. The guns were also painted in the British manner, and the green patination of the bronze was covered by a coat of pale artillery grey. At field days and reviews in the green fields of Shropshire, Powell’s tiger head artillery detachment must have created quite an impression. 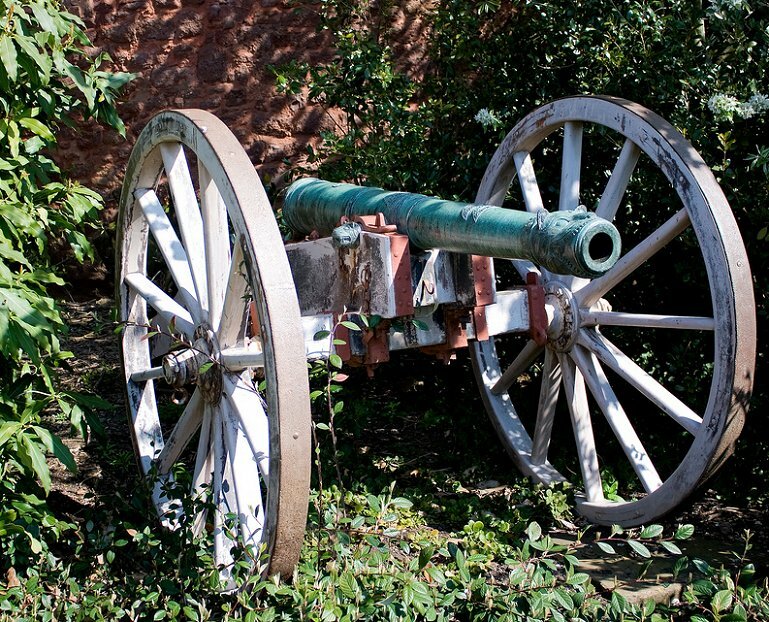 With the demise of the volunteers, the two guns were returned to the Clive seat at Powis Castle, Welshpool. They were fired to celebrate the wedding of his younger son in 1818, and again as a royal salute when Princess Victoria visited Welshpool in 1832; after that they were reduced to the purely ornamental. Today they still stand at each side of the steps to the entrance to the castle, which is now owned by the National Trust. The cannon are of 2¾ – 3 pounder calibre. They were cast in the Mawludi year 1219 (1790-91) and sport spectacular striped tiger head muzzles, trunnions and cascabel buttons, the tiger being the chosen symbol of Tipu, “Tiger of Mysore”. On the barrel is a talismanic device based on the letters HYDR, for Hyder Ali, father of Tipu, and the mark of the Royal foundry, with the inscription “La illah ul Allah” – there is no god but Allah. An almost identical piece was sold at Christie’s recently, while other similar examples can be found at the Leeds Royal Armouries, at Osborne House on the Isle of Wight, and at Sandhurst.